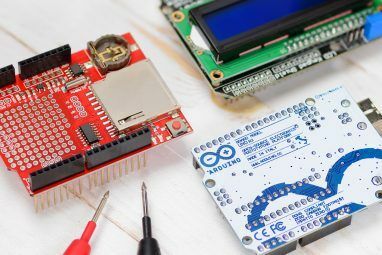 Has your Arduino been sitting around gathering dust? Well, no more. Today I’ve scoured Instructables to find 8 fun, family friendly, or just really cool Arduino projects for you to have a go at these Christmas holidays, inbetween the bouts of pies and brandy of course. If you’re stuck for Christmas ideas, an Arduino might be an ideal gift for children or the hacker in your life, and be sure to point them this way for inspiration. Just in case the word clock phenomenon has passed you by, it involves displaying the time inaccurately using words. It’s debatable as to whether this is actually easier to read (actually, it probably isn’t at all easier), but still, a very cool bit of chique Arduino art for your living room. This is however quite a complicated build, involving a lot of craft work. For an easier but no less impressive option, considering purchasing in kit form from Dougs Word Clock, with pre-cut face and components. LED cubes are simply amazing, and yet relatively simple to build. In this project, the key addition is a set of LED controller chips. The hardest part is the patience to solder 512 LEDs! If the thought of doing that makes many makes you wince in terror, try my far simpler 4x4x4 cube How To Make a Pulsating Arduino LED Cube That Looks Like It Came From The Future How To Make a Pulsating Arduino LED Cube That Looks Like It Came From The Future If you’ve dabbled with some beginner Arduino projects, but are looking for something a little permanent and on a whole other level of awesome, then the humble 4 x 4 x 4 LED cube is... Read More instead, which uses multiplexing so you don’t need any additional components either (just LEDs and resistors). Note the video attached to this project was pretty low quality, so the one I’ve included below is from a different 8x8x8 LED cube, but the same effects can be achieved. Another easy project that your kids will enjoy, a persistence of vision wands simply uses an array of LEDs flashing incredibly fast; when you wave the wand back and forth, your brain is unable to see fast enough and so the LEDs leave a trail of light in the air, displaying a pattern or words. Science, and stuff! This is an absolutely fascinating project that everyone will love, and there’s some serious science in there and signal processing. If I’m understanding this correctly, the trick involves generating a electrical sine wave and then detecting the changes in capacitance to that waveform as you touch various parts of an object. 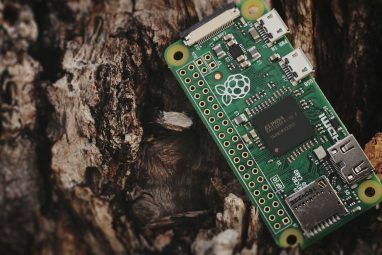 A computer is also needed to run the Processing sketch, and you’ll need quite a few inexpensive additional components, so this one will need a bit of preparation. The results are stunning though, and would make a real interactive centrepiece for the living room. If you’ve seen the Neurowear ads for wearable ears and wagging tail (from Japan, where else?! ), you’ll know what these are and why you absolutely must make some now. 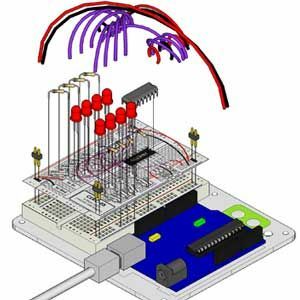 While this Arduino version certainly won’t read your brainwaves, it is quite a simple project with servomotors that’s probably more demanding in the arts and crafts department, so a good project for the family I think. If you do want to take this a step further, integrate an inexpensive brain wave reader from a kids game that they got bored of ages ago. Do you enjoy playing with a laser pointing and having your cat chase it? Who doesn’t!? But I’m sure after a few hours your arm gets tired, and for those situations what could be more useful than an automated laser pointer turrent platform? Again, this is basically quite a simple project with servos, but it looks pretty impressive and definitely Christmas holiday-worthy. It looks like he’s also used a bit of Meccano (or “Hillman Hobby Parts”) for the turret structure. Utilising a basic Hexbug kit from Radioshack, an Arduino nano and an ultrasonic sensor, this cute Hexbug becomes autonomous – navigating around quite happily on its own and avoiding obstacles. More of a hack to an existing project, but a lovely little project anyway I think, and probably at a good level of difficulty for kids too. Combine with previously mentioned laser turret for maximum cat enjoyment. Apologies for mutating this list into Arduino Cat Toys toward the end there – but I’m sure your kids or you will have fun making them, and they may also be applicable for dogs. 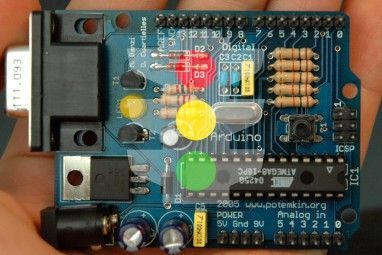 Do you have any cool Arduino holiday projects planned for this Christmas? Awesome I really love this list!! I'll give the Cube and the Wand a shot. Thanks!!. Thanks Graham - that is indeed 9000 levels of awesome. I collect all Arduino projects. I would like to make that 8x8 cube. Pretty. But there is no way i have the patience to solder that much.